The Merriman award represents excellence in broadcast writing, visual storytelling and reporting. For American University (AU) journalism graduate student Jordan Houston winning this award has been a humbling experience. "I’m honored to be recognized for sharing these same values…grateful for this incredible opportunity and the many others that I’ve been given through AU so far," she said. For a young journalist receiving the Merriman Award, an honor named in memory of the CBS news writer John Merriman who was president of the Writers Guild-East, is a major milestone on a successful career path. 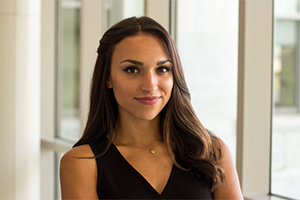 While earning her master's at AU, Houston is working as a graduate assistant at the School of Communication’s Investigative Reporting Workshop, working alongside Executive Editor Chuck Lewis and Lynne Perri. Houston writes for the IRW website on a variety of journalism-related topics. The majority of the events she has covered feature critical discussions of journalism’s shifting landscape, or analyze the reporting techniques of different renowned journalists. In addition to writing she also assists with the production video content for the website. It has aligned well with her academic specialization in broadcast journalism very well. "I think the mentor-student relationship between the IRW staff members and the graduate assistants is unique and benefits everyone at the Workshop," she said. Investigative journalism takes a certain amount of finesse, and Houston has applied a keen eye and steady hand to the challenge. "Investigative reporting is journalism’s greatest strong suit. It has the ability to expose hypocrisy, hold powerful individuals and institutions accountable, spark reform, change minds, and ultimately, change lives. If funding is available, investigative reporters have the luxury of time—they have more time to dig deeply into topics, unlike daily news reporters, which allows for in-depth reporting to tackle larger stories," she explains. Later this year Houston will continue her work on a larger project featuring water contamination in the US, an issue that resonates with Americans across the country now more than ever. She hopes to use this opportunity to hone her skills a data reporter in order to broaden her dimensions as a journalist. Her advice to women in journalism is that of reporter Megyn Kelly, ‘be so good they can’t ignore you,’ that is something I try to live by every day,” she admits.